During a Yoga class, a friend brought some Peanut Butter Energy balls, and I was instantly addicted to them. They’re rich, not too sweet and give such an energy boost. So, why not make some using Matcha and some nuts? 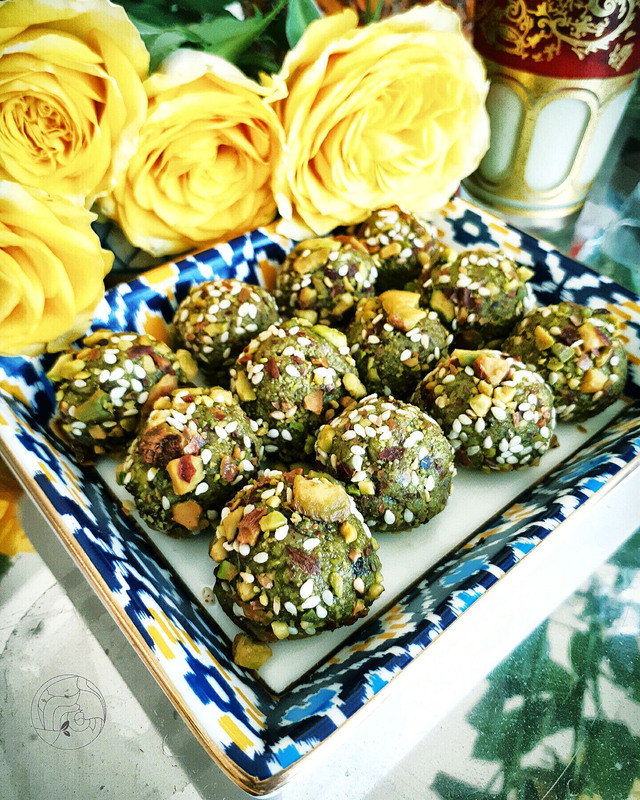 As it turns out, there were already several recipes out there with existing Matcha and pistachio nuts! After trying different variations of them, we came up with our own adaptation adding more depth and flavors—things you already have in your kitchen pantry. The mix is a gorgeous green, giving you good carbs, good fat, fiber and a bit of protein—an excellent healthy raw snack. You can also prepare them ahead of time for social engagements. Just coat them with different toppings and get creative with the shapes. They also make as great gifts. Get a small tin box and line with wax paper. Layer the Matcha balls nicely and tie with a ribbon. We just love how versatile this is! Mix all the ingredients together in a food processor to a coarse or fine consistency, to your liking. Roll the mix into small balls, about the size of quarter or medium size coin. Roll the mix over the mixed course pistachio, sesame seeds, dried rose petals and matcha powder. You can also use cocoa power, shredded coconut or melted chocolate. Place in an air tight container in the refrigerator up to 4 days. We recommend sifting the matcha using a fine mesh sieve, as it tends to clump up when mixing with other ingredients. If the Bliss Balls are a bit too dry for you, you can add a tablespoon of almond milk. Do use unsalted nuts, as the Bliss Balls can get a salty if you use all ‘salted and roasted’ nuts. There are several grades and subgrades of Matcha that we’ve come across. We recommend using a high quality premium culinary grade Matcha (preferably originating from Nishio city or Uji city in Japan, the top producers of matcha). While the color may not be vibrant electric green like ceremonial grade (highest grade), it is still very bright in color. Lower grade matcha will have a stronger bitter taste and yields a yellow-olive-brownish color, that’s coarse in texture. Tried & Tasted by: Yvette A.